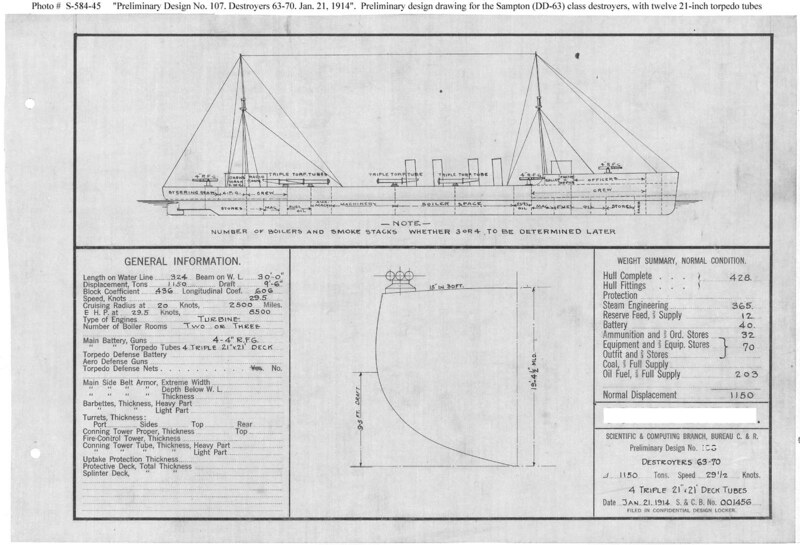 "Destroyers # 63-70 ... Jan. 21, 1914"
Preliminary design plan prepared for the General Board during consideration of designs for destroyers to be included in the Fiscal Year 1915 program. This plan provides four 4-inch guns, turbine machinery and a speed of 29.5 knots in a ship 324 feet long on the load water line (L.W.L. ), 30 feet in beam, with a normal displacement of 1,150 tons. This design was pursued in the construction of the Sampson (Destroyer # 63) class, which included Destroyers # 63 to 68 and had four funnels as shown here. The original drawing was labeled in error as "Preliminary Design No.106" (that number had been assigned to a 7500-ton cruiser design -- see Photo # S-584-046) and this copy was marked up to indicate that it actually represented "Preliminary Design No. 107".